What is the motivation for the bank to offer a Doctor this type of loan? 1. Cross-Selling – Physicians will most likely turn into future “high-earning” borrowers who will soon need some place to do their banking and investing. 2. Low Default Rates – The default rates on these loans are substantially below normal levels. 3. Referrals – Physicians (including doctors, dentists and veterinarians) are a group of professionals who typically would recommend their bank to their colleagues. 1. Made only to their target group (doctors, dentists and veterinarians). 2. Require very little down payment (0-5 percent). 3. Normally does not require private mortgage insurance (PMI), even if less than 20 percent down payment. 4. Often does not include student loan payments in DTI (or a lesser payment). 5. Will accept a contract as evidence of future earnings—in lieu of paystubs or W-2s, which don’t yet exist. 6. Interest rate will be slightly higher than conventional rates, but there normally would be no difference in rates even if loan amount is a jumbo size (>$417,000). Many banks covet these loans for the borrower’s high earning capability and the potential to cross-sell additional bank products. These loans are rarely in default and promote goodwill among a profession that banks find extremely profitable to do business with. So if the Doctor Loan Program sounds “Too good to be true”… it’s not. These banks want Physicians as long term customers. Doctor Loans are also beneficial because they allow lenders to reach out to a certain market in a tailored way that will fit their needs. 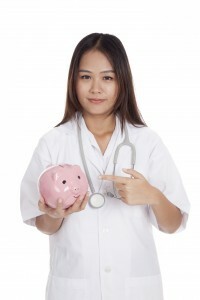 Not only are there doctor loans, there are also real-estate and other related loan programs. Not to mention generalized “jumbo loans”. This was a great article! Thanks for helping education people about Doctor Loans! I feel that this loan is designed to help out the borrower who has worked so hard for the last 10 years to purchase a home. Furthermore, the amount of student debt that this class of professionals have are a lot and many work to pay off their debts within a certain time frame so why not allow for a home to be in the mix. We are so grateful for the service that Professionals provide and the talent is great so I am happy that there are programs like to this to help out individuals who work hard. I am once again rendered speechless, on a daily basis as of late! These young upcoming professional, just wrapping up school coming into their own, as it were, juggling all these responsibilities and student loans on top of that. Very determined, focused, ambitious, admirable to say the very least! I would be proud of this individual, were they my child, As I am of my own! !